You know how everyone always says there’s no way Angelenos could live on local water alone? I had to test this assumption as my warm-up to a standard Thanksgiving exercise, naming something I’m grateful for: freshwater and all the lovelies it supports, in the myriad chain of life descending from the availability of freshwater. There are obvious lovelies – cottonwood, willow and sycamore trees along riparian corridors. I recently finished reading Remi Nadeau‘s The Water Seekers, a book which I highly recommend. It’s a very readable (almost folksy) history of Los Angeles and broader Southern California efforts in seeking water from faraway places. It focuses mainly on the water grabs from Owens Valley and from the Colorado River, with excellent overview and lots of great detail – especially excellent anecdotes and stories. It’s fairly balanced – not excessively booster-ist about how much thirsty L.A. really needed all that water. There are probably more than a dozen L.A. Creek Freak posts I can drag out of The Water Seekers. I will start with a somewhat minor one – the story of the city of Los Angeles’ Headworks site, with some related water conservation and legal history thrown in for good measure. The Arid Lands Institute at Woodbury University is offering free! workshops to bring out your inner DIY’er to help you make LA more livable in the long run. Saturday, April 3: Water Smart Landscapes: Yard, Driveway, Sidewalk, Street with Fritz Haeg of Edible Estates, Holly Harper of North East Trees, and David Fletcher of Fletcher Studio. 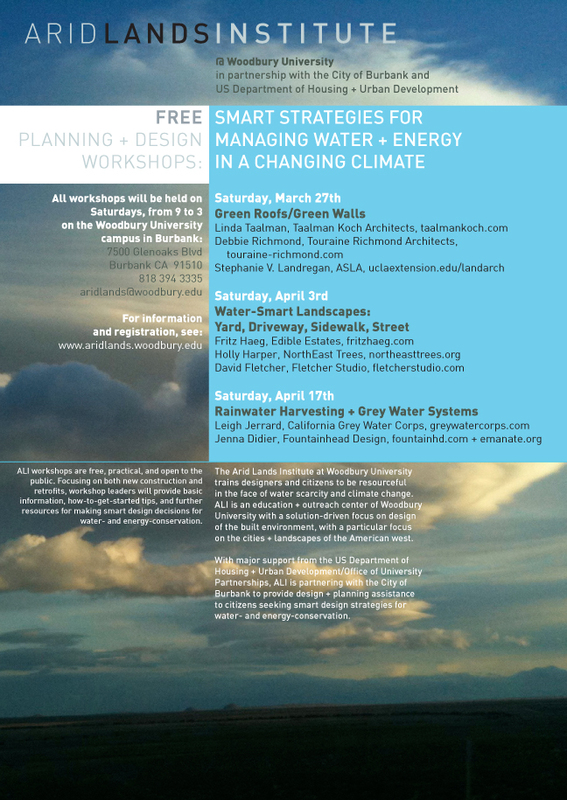 Saturday, April 17: Rainwater Harvesting + Grey Water Systems with Leigh Jerrard of California Greywater Corps and Jenna Didier of Fountainhead Design. Creekfreak gets a nod in Emily Green’s Dry Garden blog in the online edition of the LA Times today as we talk about how to bring the creekfreak ethos into your garden. Follow the water – and the link – for more. Two more water mains burst overnight, bringing more questions (LA Times). Be sure to check out the comments. Steve Lopez also enters the fray: Awash in trouble, it’s time to spout off at DWP(LA Times). You know, pipes just want to be springs. They want to well up, create nice pools. They’re tired of being all infrastructure, no beauty. They want us humans to happen upon them, awe-struck by the gurgling bubbling water. And for a brief millisecond we are. We respond to the whiff of cool fresh water, and then register the pipe, the overflowing waste as it spreads and flows over lawns or infrastructure. Or causes a big sinkhole. And then we get mad. The anger is inflamed by the sense of helplessness, watching that water gush on, knowing it is water wasted. Wondering when someone will fix it. Ravine in Elysian Park does pick up some rainfall runoff, but the broken pipe's steady flow keeps this "stream" wet. I lived in Echo Park for nine years. And for nine years, a broken pipe in Elysian Park has trickled water down a ravine. Maybe it is a fire sprinkler line, but it’s the size of a big supply line. I called the rangers once, and even mentioned it to park staff I was working on a project with. I got no response from the former and a bit of a push-back from the latter. It was still going on my last walk in Elysian Park, supporting a mini-forest of invasive non-native acacia and other non-native plants. And you know how I feel about invasives. But for some people, a broken pipe can be a lot more personal. It can even mess with your job. A friend of a friend (yes I’m keeping this anonymous, sorry if that’s sketchy) lives in the hills. A water line broke behind his house. His bathroom has now been flooded for four weeks. Maybe a contractor broke it, maybe it’s a DWP line – either way it’s drinking water down this guy’s bathroom walls. DWP refuses to deal with it, claiming it’s a broken sewer line. Hmmm. Well, that response – and way of dealing with the problem – takes it up a notch from what’s reported in this 1990 LA Times story, “DWPs Response to Leak Leaves Residents Steaming” And that’s really saying something. That article indicates that DWP has so many water breaks to deal with that they often can’t respond to a relatively minor break for several days. They estimated that they lose 8% of their water to breaks and other losses(evaporation etc). So the 1914-era infrastructure that just gave us a mighty sinkhole and also broke elsewhere the week before on Ventura Blvd reflects that condition. What’s more, Ventura Boulevard’s water lines keep breaking, sometimes in a much more exciting fashion. In 1995 it broke and created a geyser. With our precious imported water busting loose all over the city, maybe it’s time for an assessment of the infrastructure – and the maintenance teams. Need I say it? It’s not acceptable for imported water that could be keeping endangered species alive to be just gushing over our asphalt. In the meantime, I suggest you head over to Elysian Park, hike on over to the leaking pipe and marvel at all the invasive plant life it’s supporting. Starts at home. At the water meter. LA City staff proposed a tiered water rating system, in which if a user exceeds a certain volume of water consumption, they go up to a higher rate for the additional water use – and City Council shot it down. Unanimously. This time (sounds likely they’ll be another round). LA Observed thought this deserved attention, and so do I. Maybe the Times will report on it tomorrow? While I am a supporter of tiered water rating, there’s also an equity issue – how do you fairly charge by household when some households have 1 person and others have 4 or more? We can come up with nonintrusive but potentially unfair (as above) methods with flat water tiers (you consume over X gallons total, you go up to the next rate) or we move into some complicated and potentially intrusive methods, counting members of households etc and allocating a base volume from that (I just made that method up, btw, as an example of an intrusive but fair way to do that. I don’t know what was actually proposed by the City). You are currently browsing entries tagged with water conservation at L.A. Creek Freak.